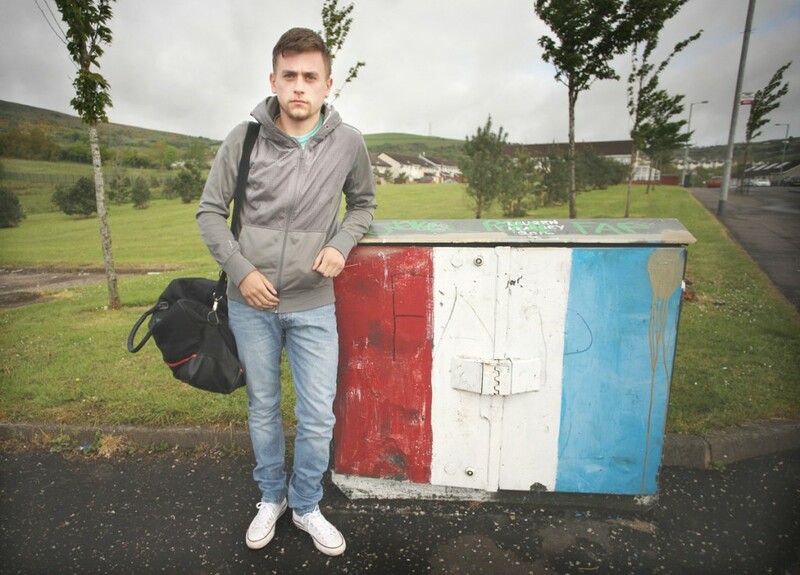 Thomas McCormack in Forthriver Road – he was forced to flee the district after sectarian graffiti was daubed on wall of his new North Belfast home. A YOUNG Catholic man who was rehoused in North Belfast says he’s been forced to leave his home following intimidation and sectarian threats. Thomas McCormack, who is from Ballymurphy in West Belfast, was assigned accommodation in the loyalist Forthriver district on the Glencairn Road. But the 22-year-old is now homeless and living with friends and family after he felt he had no choice but to flee North Belfast after sectarian slogans were daubed on the walls of his home. Thomas told the North Belfast News that he was initially happy with moving across the city. “I’d never heard of the Forthriver area of North Belfast,” he said. “I had no idea where it was when I was offered accommodation there. Thomas says that his concerns about the area began soon after he received the keys to his new North Belfast home. “One day shortly after I got the keys, there was a male standing outside my door and he was asking me a lot of questions about where I was from and who I was living with,” said Thomas. “I didn’t know what to say. I was a bit scared and just told him that I was from down the road. “It wasn’t until the slogans ‘UVF’ and ‘KAT’ appeared on the wall of my place that I went into panic mode and thought I had no choice but to get out as soon as I could. “I didn’t even know what KAT (Kill All Taigs) stood for as I had never seen it before, but when I found it, I was really scared. “I would have lived there no bother if it hadn’t been for the intimidation and the threatening sectarian messages. To be honest, I’d live anywhere. “Some of my family told me that I couldn’t go back there because my life would be in danger so I had no choice but to pack up and go. Thomas, who has suffered from depression and anxiety since the incident in March of this year, is hoping to find new accommodation in West Belfast. Thomas also told the North Belfast News that he received a letter from the Housing Executive stating that he “became homeless intentionally after he voluntarily terminated your NIHE (Northern Ireland Housing Executive) tenancy”. But after being contacted by the North Belfast News, the NIHE have now re-instated Thomas on the housing waiting list and restored his allocation of points back to 120 after they were reduced to just 30. He is now hoping to secure accommodation closer to his original home of Ballymurphy in West Belfast, possibly in the Lower Falls or Andersonstown areas. “I would feel a lot safer in West Belfast after what happened across the city. It’s closer to the area which I know best and come from. “I just want to live a normal life and feel safe,” he added. A Housing Executive spokesperson said: “Thomas McCormack opted for Choice Based Letting and chose to live at this location. “As part of this process, he received an accompanied viewing with a Housing Executive staff member to allow him to view both the property and its location before he accepted the tenancy.